For many of us, life has become so hectic that we scarcely have time to think about what we’re stuffing into our mouth each day. But our “gulp-and-go” lifestyle is taking a toll on our health. “Americans no longer ‘eat to thrive’; we now ‘eat to survive’, says nutritional biochemist and wellness expert Dr. Janet Angel. 1. Eat only when you’re hungry. Many people eat when they’re not even hungry. They eat because they think they should eat: It’s lunch time. Or, they have to eat because they’re on a schedule at work. Forced eating starts early with our kids. We make them sit down and eat with us. But if we were living in Nature, foraging for our foods, we would eat only when we were hungry. When your body is hungry for the plainest of foods, it’s telling you that it’s ready to manufacture the enzymes for proper digestion. And don’t mistake thirst for hunger -- try water first. It’s preferable to eat foods of one type all at the same time. Have meats first, slowly, which will allow the brain to trigger production of the body’s strongest digestive enzymes, the proteases. Add a little salad, and after 15 minutes, eat your potato. Twenty minutes after the potato is gone, fruits or sugared desserts are okay to eat. Probably the worst error would be to go to a buffet and gorge yourself on foods you don’t generally eat that are grown in different vicinities or on other continents. It’s very difficult for your brain to properly signal a need for the correct digestive enzymes when your body hasn’t experienced those types of food before, and certainly not all mixed together at one time. 3. Don’t Eat When You’re Feeling Stressed, ill, or injured: Boyfriend or girlfriend just dump you? Bad day at work? Coming down with the flu? Don’t try to medicate yourself with a pint of ice cream or a New York strip steak. “When we are experiencing physical, emotional, and mental stress, or when we are physically ill or injured, or when our body is too hot or too cold, our digestive system is shut down and our body is in healing mode, not digestive mode. Soup broths and juices require minimal enzymes for absorption and can be sipped slowly. Many people gulp down those big protein drinks thinking it’s a good thing to do, but. The reality is it’s like swallowing a steak, whole. You have to chew protein, or the signals to the brain won’t be there. If you don’t chew along the way, you’re shocking the system. Because we don’t know what’s being added to the food we buy when we take it home, we tend to over process it because we’re afraid we’ll get sick if we eat something raw. Meat should never be heated in excess of 118 degrees, as the enzymes in that protein are destroyed when they’re heated that high. 6. Give your food a background check. Learn how to be a food detective and know the history of what you’re putting into your mouth. Where did those apples come from? Have they been colored or sprayed with glazes and preservatives? 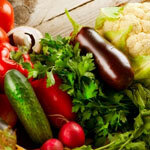 The more fresh, locally grown meat and produce you consume, the fewer chemical additives you are likely to encounter. Start your own small garden. Make sure whatever you are consuming is the finest you can purchase or grow. 7. Use spices and natural digestive aids to help break down what you eat. But what if you don’t have any digestive aids, or AbsorbAid supplements, and feel like a quick snack? “Eat a jar of baby food,”. “It doesn’t contain any chemical additives and it’s nearly predigested. It’s the ideal safe comfort food!